Many years ago Central UMC began making and selling pies during Thanksgiving and Christmas holidays. These popular holiday pies then led us to selling blueberry and peach pies every summer, including old fashioned strawberry rhubarb pies in June and apple pies in September. We provide quality and goodness in exchange for the financial support we receive from the buyers of hundreds of pies every year. A team of United Methodist Women work together in this effort and we are delighted in bringing happiness to the people who eagerly seek to buy our pies. We use fresh ingredients, make homemade piecrust and are blessed with our ingredients being donated. Every pie box has a label with a scripture message and every pie is made with love and prayers. 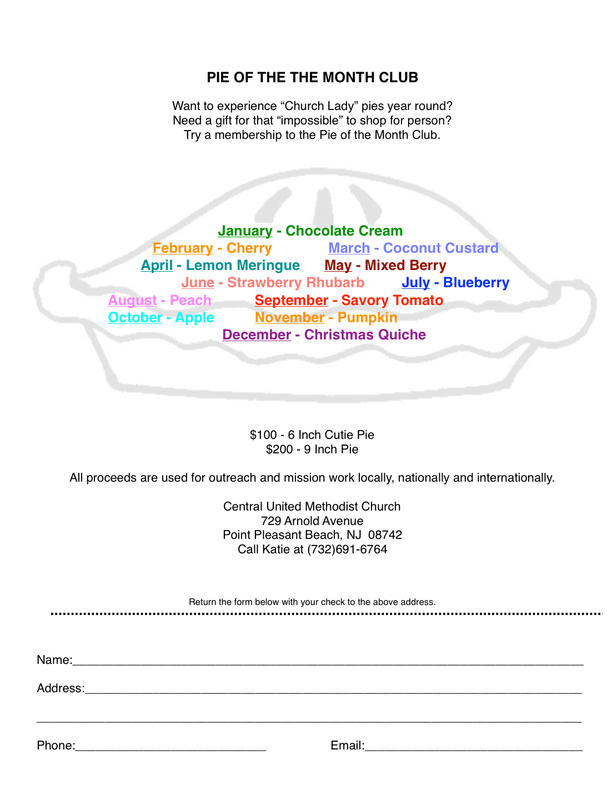 Our most recent endeavor has been the “Pie of the Month Club” which people often enroll in as a gift for someone special. Many others find the enjoyment of the pie club for their very own special selves! The proceeds of our pie sales are used for mission. We consider this to truly be a ministry, bringing all that is good to so many!